There are a number of questions that need to be addressed which will help to establish the optimum time to introduce a student to the Crabbers Scale Manual. One of the primary considerations concerns whether the cello teacher has the confidence to use the scale manual during cello lessons with the student? Teachers invariably have students who either don't like to play scales in their cello lesson or students who find the preparation of scales challenging. Scales should be a basic requirement with all cello tuition. They are also a requirement with the examination boards, so it is essential that scales be covered during cello lessons on a regular basis. The cello teacher who becomes familiar with the system can also derive a considerable personal benefit from using the manuals: practicing one key per day (twenty minutes) as a warm-up is a very efficient way to maintain the teacher’s technique and will enable him or her to play most of the disciplines within each key. At what standard should the student begin using the scale book in their cello lessons? 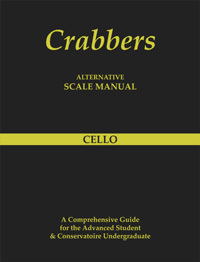 Students that have attained the level of grade five or higher may begin using the Crabbers alternative scale method, since some three octave scales are a requirement for the grade five Associated Board and Trinity Guildhall exams. The benefits of using the system will become increasingly noticeable as the student progresses. It is to be hoped that many students will find it less daunting to learn scales using the format which is employed in this method and it should then follow that they will devote more of their time to practicing their scales. Many students of grade six standard and above, and undergraduate conservatoire students, have said that they find the alternative method easier, especially the sections in thirds and sixths. Will using this method inhibit the normal standard way of practicing scales - notes on stave lines? As nearly all students will have been learning with standard notation there should be no concerns here. This new method of learning will improve facility and will focus practice time more efficiently.